The Wright Brothers (2015) is the inspiring story of two men from Dayton, Ohio who turned a fascination with birds into a mission to enable and achieve human flight. The story of the Wright brothers is a perfect example of how hard work, persistence and a touch of genius can lead to endless possibilities. The Wright brothers’ personalities and upbringing made them a winning team. You probably know that the Wright brothers invented the airplane – but do you know how they got to the remarkable moment when their aircraft took its first flight? Let’s go back to where it all started. Wilbur Wright was the older of the two brothers, born April 16, 1867, four years before Orville, born August 19, 1871. The two were virtually inseparable throughout their lives. Not only did they eat meals together and keep a joint bank account, they even had similar handwriting. But they did have their own unique personalities. Wilbur was the more scholarly of the two, and with his nerves of steel, he was clearly the unspoken leader. Orville, on the other hand, was a gentle soul who was more sensitive to criticism than Wilbur. But he was also more cheerful and more adept at the business side of things. The brothers had a modest upbringing in Dayton, Ohio, which was the state’s fifth-largest city at the time. Their father, Bishop Milton Wright, encouraged his children to be open-minded and hard-working, and made sure their modest home was well stocked with books. Their mother was Susan Koerner Wright, who would later die of tuberculosis when the boys were in their early twenties. The boys also had one younger sister, Katharine Wright, who lived with them, and two older siblings, Reuchlin and Lorin, who lived elsewhere. Bishop Wright was eager to encourage his boys' education, but he did let them skip school if they wanted to take advantage of the books at home instead. This encouragement led Orville to discover an early interest in business, and he started his own print shop while he was still in high school. Later, he and Wilbur would open a bicycle shop, which helped fund their work on airplanes. Meanwhile, it was Wilbur who became fascinated with flight, thanks to his father’s private library. He was especially taken with birds, as well as the work of Otto Lilienthal, a German glider enthusiast, and Pierre Mouillard, a French poet and farmer who also shared a profound love of flight. In the face of considerable obstacles, Wilbur and Orville built an innovative glider. From gliding, the brothers moved on to motorized flying. The brothers continued making improvements, despite skepticism from the press and military. Commercial ventures took the brothers to New York and then to Europe. Early public demonstrations were a great success. Orville had a brush with death, but this didn’t stop the brothers. The brothers became America's heroes, but they never stopped working. 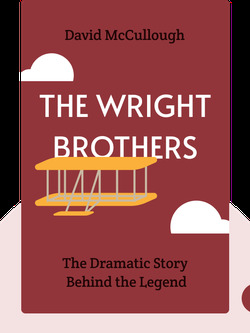 Start your free Blinkist trial to get unlimited access to key ideas from The Wright Brothers and over 3,000 other nonfiction titles. With bitesize text and audio, it's easier than ever to find the right ideas to transform your life.